One of the most essential nutrients for our bodies that provides immune function, decreased inflammation and healthy tissues is sulfur. The amounts of sulfur that occur naturally in soils that are consumed by crops is decreasing horribly each year. This is a crisis for our health because sulfur is the most abundant mineral in the body. Thankfully, there is a fairly recently emerged “miracle supplement” that can provide a biologically active source of sulfur that your body can readily use. This supplement known to be touted by media health professionals is known as MSM or methylsulfonylmethane. This simple and inexpensive product can cure allergies, reduce stress and raise immunity and energy levels. I’d love to tell you how I supplement with organic sulfur for allergies and how it eliminated my allergies. From what can be collected from research, a good source of sulfur is critical in the part of producing cartilage, connective tissue, red blood cells and treating wounds. Some allergies to food and the environment can be due to an internal wound inside your body. For food allergies, many people have “leaky gut” syndrome in which there are physical holes in your intestines that certain food particles travel through and cause an allergic reaction. If you find yourself intolerant or reactive to many different foods, then this may be the root of your issue. Supplying yourself with such a wonderfully healing supplement will heal the tissues of your gut in hours. You can see the results of taking MSM supplements in days just like I did. I had noticed better digestion, elimination of my allergies to nuts and seeds, and smooth skin and hair. 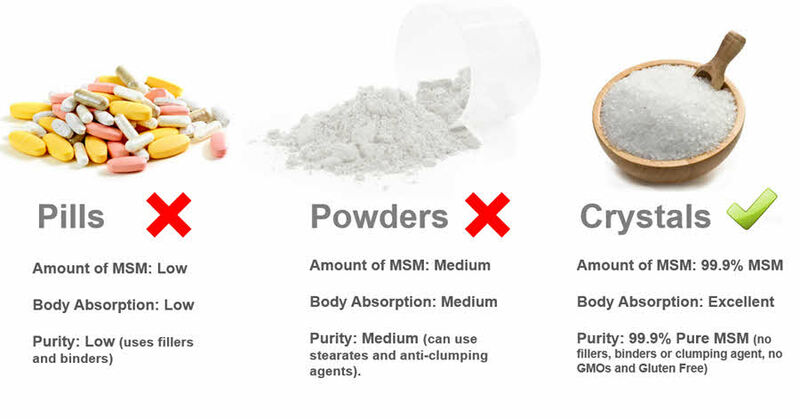 MSM supplements are available in 3 forms: compact pills, powder and crystals. Many sources recommend the crystals, the kind I use every day, because it is most available to the body. I take one scoopful of this product every day and it has improved my allergy symptoms incredibly. To date, there haven’t been many reported side effects of MSM or any well-controlled studies looking at its long-term effects. However, the Arthritis Foundation conducted a study on patients with osteoarthritis. It resulted in improved symptoms of pain without any notable side effects. Some report that MSM is capable of causing nausea, upset stomach or diarrhea in high doses and it not recommended for pregnant women. I suffer morning allergies all the time, and when the weather is changing my nose is the best thermometer, I began to sneeze a lot. I am always with allergical pills never tried natural, I think I will give a chance to your recommendation, how much you take per day? And what is the measure of the crystals? And how many days last the product? MSM is a great alternative to antihistamines because it is a nutrient with no severe detrimental effects. I usually take one serving of the crystals each day and no more than that. If I take too much, I experience “detox” reactions like bloating and enlarged glands. After a few days you can increase your dose if you’d like. I think it can definitely help.